Enduring grief, enduring joy. Different, but still. I wrote and shared this piece with my writing group back in October 2016. I shelved it, not seeing a “purpose," then remembered it when I went through the arrivals section with my husband and daughter upon our return from France recently. I had written it before my father died, so this piece is mostly about grieving my mother. Now it feels like the time to share it with you. I forgot... until I remembered. Time and time again, I do this. I forget... until I remember. I pass through customs of my airport and push through the double doors that swing open to the non-secured area. And then I hit the wall of people; limo drivers holding signs; young families expectantly searching for the appearance of their elderly parents; lovers reuniting; friends reconnecting. Hugs shared, and tales of travels and sights seen spilling from mouths. I forget about this joy. Until I remember. And then I hit another wall. I am punched in the gut by grief. Tears sting the corners of my eyes with such sudden ferocity that I need to pause to catch my breath. And I can’t ever seem to get enough breath. I am overcome. Wrought. And lost in the memory. Like it was yesterday, rather than fifteen years ago. I can HEAR her like it was yesterday, rather than fifteen years ago. First the shriek then the “TANYA." Like I’d come back from the dead. We had just come back from Europe. I abandoned my suitcase with him to run over to them, squeezing them both with a happiness I didn’t expect to feel. My mother beside herself with joy and tears that we had returned home safely to her arms. Both of us. My father happy too. But in his own, quieter way. Mostly happy that we went. My mother happy that we came back. We linked arms and chattered like we’d been apart for a lifetime, rather than three scant weeks all the way to the car, and didn’t stop talking the whole drive home. Once home, drinks were poured and she could barely contain herself while we opened our suitcases to share the souvenirs we brought back for them. The J LeBlanc et Fils pine nut oil from Paris and the ancient oil vendor who told us about each pressing. The Mariage Frères tea purchased at KadeWe in Berlin. The foie gras from Beaune. The poire William from Tours. The gag gifts of cheap lighters from every city. The silk scarf from the boutique near the Louvre. Each gift made her exclaim with delight. Each gift made me wish I had ten more to give her. Each story made him counter with a story of his own. Each story made me wish I had ten more to tell him. We’ll all go together one day, we promised. I shake myself back from this memory, only to find myself, once again at the airport with my tears and my luggage and a fervent desire to tell the huggers to never ever ever let go. To never ever ever miss the opportunity to share time, stories, love with each other. But I don’t, because I know it won’t save them from the stings and punches that are coming. In time. They will come in time. That’s just how love works. They go, we stay, holding the memories, the broken promises and the silk scarves. And the grief. This Sunday when we passed through the double doors, I tasted the familiar joy-grief cocktail. But this time, with tears stinging my eyes, I reached for my daughter and husband’s hands and felt good. Felt strong. You see, we had just returned from a family trip to France precipitated by my father’s dying wish to have some of their ashes scattered there. So we did. Turns out, we did all go together. Just like we’d promised. Different, and still. Enduring grief, enduring joy. Different, and still. After my dad died, I made some promises to myself. I’m excellent at keeping the promises I make with others but don’t have the best track record with keeping promises to myself. So, it's no surprise that “keeping the promises I make with myself” moved to the top of my promise list. The second promise I made was to get into right relationship with my heart and begin treating my heart with the same reverence and care that I give to others. And, in truth, it’s a curious time to explore it, what with grief being seventeen thousand kinds of messy. It’s hard to know which way’s up and which way’s down. And it’s hard to know if I can trust my emotions. Hard to know if I can trust my heart. That I can’t trust my heart. It’s my HEART that should be mistrustful of ME. I’ve ignored and shelved and bartered and negotiated and bypassed and done everything BUT listen to my heart in more ways than I care to admit over the past couple of years. So, to get us back on the same page - what this has meant (so far in any case), is that I need to listen to my heart when it summons the courage to ask me for something. And offer it what it desires freely and enthusiastically and reverentially. Nomaddawhat. It’s Valentine’s Day and my heart asked me to write this to you. So I did. 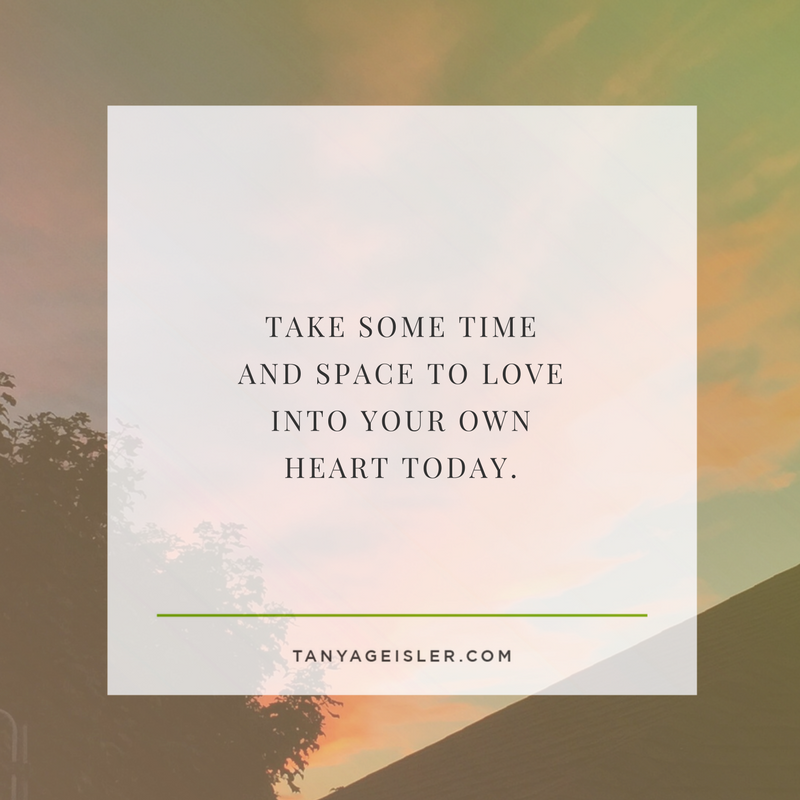 Take some time and space to love into your own heart today, will you? Listen to it. And honour it above all else. You’ve only got this one. Treat it like the source of all things sacred that it is. A big man passed me on the winding staircase at a pub. In the cramped space, his broad shoulders brushed against mine. Oh, I’m so sorry, he said anxiously and hunkered in upon himself. No problem, I responded lightly. And off we went in our separate directions. His response stayed with me. And it wasn’t that his sorry wasn’t a reflexive polite Canadian quirk. It was his shrink-back response of the sea anemone. Like his size was an affront to me. Like his maleness was a sin. You’ve seen him too. The man who goes out of his way to cross the road so he doesn’t come to close to you at night. Because. His discomfort with himself (or was it his discomfort with me?) was discomforting to me. You say you’re sorry. For what? For being a man? For having broad shoulders? For taking up space? For your ancestors? But what if you didn’t need to be sorry? What if we stopped apologizing and just say, started from here? Heya sister. Heya brother. I see you. We're here now. There's plenty of room for both of us. As we are. No need to make yourself smaller for me. You doing so does not ensure that I’ll take up more space. That’s on me. (Click to tweet.) I bow to the divine masculine and feminine in you. (And yes, you are oh so divine, you in your magnificent God-given frame that is a reflection of your soul. And no belittling or blaming or shaming will change that. Doesn’t work. Never did.) And from here, in bowing reverence, let’s celebrate who and how w e can be. Hold space for me to do my good work without trying to control me. I’ll hold space for you to do your good work without trying to coddle you. Let’s get this thing right, from here on out. And while we’re here, let’s make a deal: let’s save our sorries for our own missteps, mistakes and missed turns. (Click to tweet) Let’s learn from them. And then let's move on. That's what I would have liked to have said to him. 24 easy answers. And the hardest answer of all. It’s frustrating, I know. You ask the hard questions and get easy answers. Like E-Z answers. Ludicrously trite answers…the kind we’re all guilty of doling out. (Yeah…me too.) These answers endure because, well, their simplicity is magnetic. And stitched right into them is TRUTH. But it’s partial truth…the kind that is ignorant and unconcerned about context. So without further ado, 24 easy answers. And one really really hard one to swallow. Loving your outside is an inside job. Write like a lover, edit like an ex. Don’t worry about what everyone thinks. But the hardest one of speaks to a truly deeeeeeep desire. How do I become free? Hard. Trite. And as true as anything you’ve ever read. My 42nd Birthday…and a Sale! I'll tell you about the sale in a moment. But FIRST? The backstory. I’m turning 42 this year. Today, to be precise. I’m happy about that. It’s an age that has some heft. It feels…substantial, but not weighty. It feels right and good. Neither old, nor young. Just where I’m at. I also know good things are coming this year. I can feel them. I catch twinkles, sparkles and glimmers out of the corner of my eye. And I’m abundantly ready for what they’re about to reveal. And yet, it’s a curious number, this 42. What IS the Ultimate Question, you ask? Now THAT’S a good question. It’s never revealed, because it’s never asked, because it’s never known. So, because it’s MY birthday (and I’ll posit if I want to), here’s what I think. And I think the ANSWER to the ACTUAL question to life, the universe, and everything is to “make the most of this life AND treat each other right”. There it is. I’ve been afraid to share this for fear that it’s overly simplistic, not profound, or cerebral enough (oh, HELLO Impostor Complex). But at 42, I’m making peace with the fact that stunningly simple is also my kind of genius. And who am I to dismiss the very belief that has informed my life since I was a very very young girl. How do I create the life that I truly want in the kindest, most considerate, most loving, most empathetic and most compassionate way possible? How to make an impact while I’m here while still treading lightly and treating others well? How do I support others while supporting myself? Usually, the way is led by love. Other times, instinct. Others still, intuition. I get it wrong when I don’t listen deeply. (I often get it wrong, but the learning curve is getting smaller.) But I also know that I get it right when I’m surrounding myself with good people. The kind who share approximations of my beliefs, feelings, desires, and wishes. Who also want to create a life of purpose and meaning while treating others right. I’ve come to realize that my Board of Your Life program actually OFFERS the answer to the question: “what am I here to do” IN THE WAY that speaks to “treating each other right”. So for my 42nd birthday, I want you to have the Board of Your Life kit. But not just you, Darling. You AND a friend. (Everything is so much more fun when we do it with a partner). You know the friend. She’s done all the right things, but things haven’t quite clicked into place. You can see the massive potential available to her as clear as day, but she cannot. She is ready to meet her raison d'être (even as she fears it a little). And you can help her, in community. And SHE can help YOU to actualize “making the most of this life”. 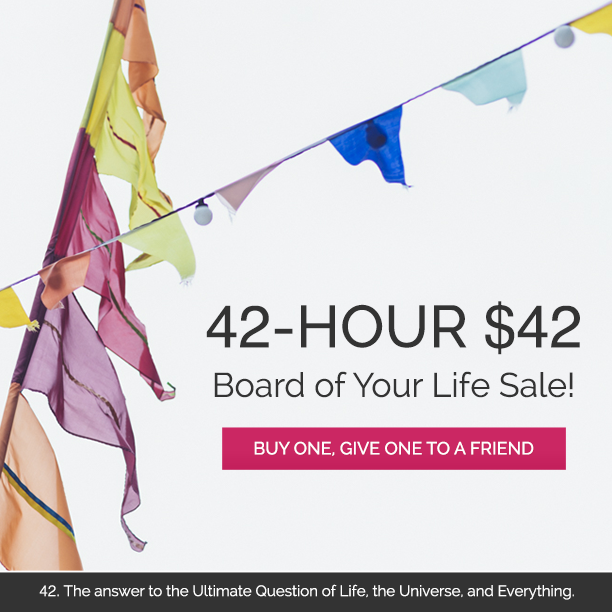 So, the program that is normally $150, is now $42 (for TWO COPIES) for 42 hours, starting now and ending Sept 29th at 6:01pm EST. You have no idea how happy this makes me on my birthday to imagine the wild and swoopy spirals of joy that will come from so many people doing this work. And so my 42nd begins.